Join Pamela Jaccarino, Editor in Chief of Luxe Interiors + Design and Ellie Cullman, Founder of Cullman & Kravis Associates for a dynamic conversation exploring the Evolution of Design. 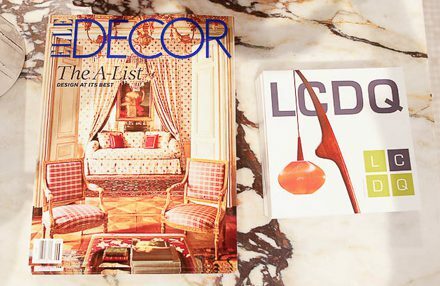 Images from Cullman & Kravis’ new book From Classic to Contemporary will inspire and entertain. Margaret Russell, Editor in Chief of Galerie Magazine, leads a lively discussion on the late scholarly Genoan architect, theatrical designer and interior designer Renzo Mongiardino with Michael S. Smith and Martina Mondadori Sartogo, founder of Cabana Magazine and author of Renzo Mongiardino: A Painterly Vision, with a book signing to follow. 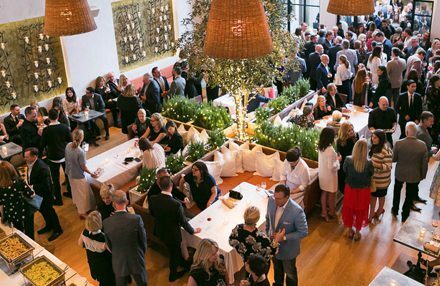 Due to unforeseen circumstances, this event has been changed to an open house hosted by Rose Tarlow herself, along with Milieu magazine Design Director Leslie Newsom Rascoe. Design, and journalist Ted Loos examine the relevance of Edith Wharton and Ogden Codman’s seminal 1897 book on decorating. Q&A from the audience, book signing and light refreshments will follow. California Homes Editor in Chief Susan McFadden chats with architect Erik B. Peterson and designer Barclay Butera on the ins and outs of designing in the Golden State. Join celebrated actress, advocate and vintage lover Sophia Bush alongside Chairish co-founder Anna Brockway as they lead designers Nathan Turner, Mary MacDonald, Nate Berkus, Jeremiah Brent, Mat Sanders, Betsy Burnham, Georgia Tapert Howe and Sarah Sherman Samuel in the lively panel game of Love It or Hate It. 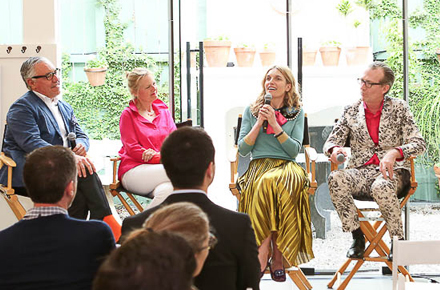 This is a don’t miss event, where megawatt design personalities weigh in on the latest trends. Remember the show back in the 1960s called “The Dating Game?” Well we are bringing it back, but with a little twist! Join moderators Analisse Taft-Gersten owner of ALT for Living and design editor Robert Rufino as they guide Top 100 Designer Shawn Henderson to find his ideal interior designer from the three mystery guests. Join us for a breakfast and book signing as Nathan Turner serves up his favorite recipes at Charlotte Moss’s breakfast table. Copies of Charlotte Moss Entertains and Nathan Turner’s I Love California will be available for signing by the authors. Book signing and reception for architecture and design photographer Tim Street-Porter, whose latest book features host Martyn Lawrence Bullard’s Palm Springs retreat as well as a foreword by fashion designer Trina Turk. Book signing and reception for designer Ray Booth, a partner in the prestigious McALPINE firm who divides his time between New York and Nashville. Author and journalist David Netto engages in a lively, illustrated conversation with Emily Evans Eerdmans, author of Henri Samuel: Master of the French Interior, noted design expert and teacher at the New York School of Interior Design. Book signing and reception to follow. Join Gracie for a meet-and-greet book signing with Kimberly Schlegel Whitman, author of a new book on entertaining: Parties Around a Punch Bowl. Book signing with Los Angeles architect Patrick Tighe and his notable book Patrick Tighe Architecture: Building Dichotomy, with cocktails and light bites to toast Patrick and window designer Kristine Paige Kamenstein of Jackson Paige Interiors. As we surf the internet for the perfect piece for a project, how do we make sure that what we see is what we get? And if we don’t get what we expect, how do we make it work? In this industry, can we really afford to take the easy route or is there no compromise for visiting showrooms to see and touch the elements we place to complete the perfect home. Join Rebecca Birdwell, brand strategist and Managing Director of the Design Leadership Network, at a working lunch in the VIP/Green Garden Lounge sponsored by Pacific Sales as she leads this problem-solving discussion. As allegations of harassment unfold in high profile work places, this discussion focuses on the trials and tribulations of designing for clients who cross the line. How and when do you draw that line and how do you refrain from going beyond the call of duty for your client? Join Meg Touborg, marketing strategist and co-founder of Leaders of Design, at this working lunch lunch in the VIP/Green Garden Lounge sponsored by Pacific Sales as she leads this problem-solving discussion. Special floral display and personal appearance on Wednesday by Sara Ledterman, Founder & Creative Director of Gather & Serve California, a new designer brand of modern artisanal ceramics, glassware and accessories inspired by California living. On Thursday, al fresco tablescape and Gather & Serve pop-up shop in the garden. Free shipping within California will be provided. 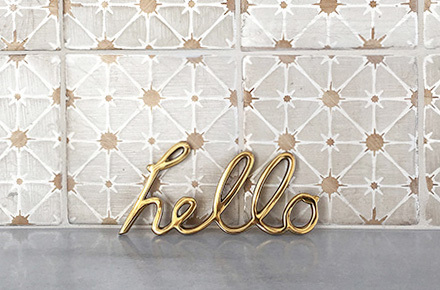 Mix and mingle with designers and artisans Wednesday morning and see the latest introductions from Carolina Irving, Fermoie, Hollywood at Home, Lake August, Lisa Fine, Penny Morrison, Peter Dunham, Schuyler Samperton, VOUTSA, and more. Join us under the tent at Harbinger for a Maker’s Souk featuring demos and interactive experiences. Shop for statement jewelry from Sally Drennon, original art and prints from Alex K. Mason & Sharon Lee, and one-of-a-kind vintage finds from Chris Barrett Curated. Sips and snacks will be served in the Moore & Giles Airstream lounge. Join us for champagne and a look at Kelly Wearstler’s latest furniture, lighting and home collections at the Kelly Wearstler Flagship Boutique. Gather in the kitchen for an interactive conversation featuring the unique design viewpoints of Alfredo Llamedo-Sierra, Erica Islas and Peter Grisdela as they explore kitchen design, functionality and its role in today’s modern lifestyle—all while preparing a culinary treat or two paired with mimosas. Presented by Luxe Interiors + Design. Enjoy decadent delights as your recharge your devices at Sherle Wagner International—we can’t wait to show you what we’ve been up to! Champagne courtesy of Bain Ultra. Coffee and pastry courtesy of Jenn-Air. Get creative and join San Francisco textile artisan Seema Krish and her design team to get hands-on with block printing. In this demonstration, learn the basics of block printing and pattern-making and leave with custom printed napkins! Beginners welcome; just bring yourself! To be followed by drinks/nibbles. Dessin Fournir presents an exhibition of designer Tom Stringer’s travel photography and silent charity auction to benefit Habitat for Humanity Greater Los Angeles. 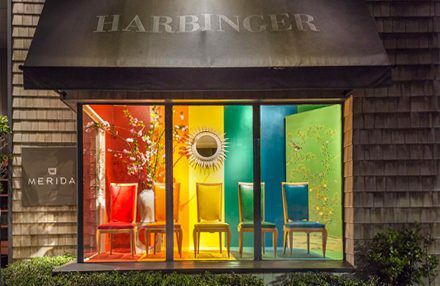 Dessin Fournir CEO Chuck Comeau will have a Q&A with Stringer about how the designer uses discoveries made on his global travels to create rooms true to his clients' own personalities and passions, and the importance of delivering interiors full of personal narrative. Cocktails and hors d'oeuvres will be served in the garden throughout the afternoon. Join Dragonette Ltd. for a drink with Italian designer Achille Salvagni as they introduce the man and his work to the West Coast exclusively through their LCDQ showroom and showcase a group of designs from his ALDUS collection. 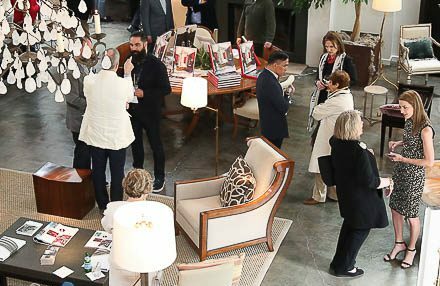 Una Malan hosts an all-day celebration in her newly expanded showroom as she becomes the first showroom in the U.S. to represent Rossato from Italy. Coinciding with the King Tut exhibition in Los Angeles, Barakat Gallery will be presenting the timeless design of Ancient Egypt. Join us for bubbly and mummy artifacts. An exhibition entitled « THEY » illustrates how dialogue produces and stimulates creativity. Six talents invited for that show will be on hand to talk about their own expertise and vision of tomorrow’s home: EF Kitchen, American photographer, Emmanuel Levet Stenne, French designer, Alexandra Loew, American interior designer, Nicolas and Sebastien Reese, French creators, and Isabelle Sicart, French ceramist. 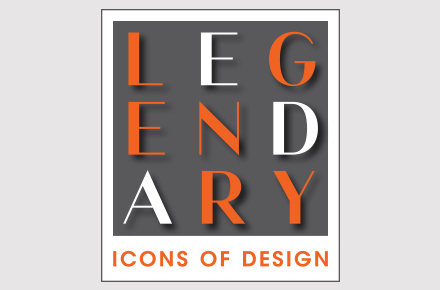 Join California Home+Design Editorial Director Lindsey Shook in toasting a clever collaboration between Rhodium Floors, Victoria + Albert and Neptune Glassworks, on display during Legends! 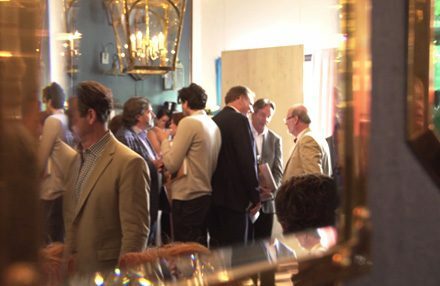 Enjoy cocktails and conversation on the importance of partnerships in the design community. 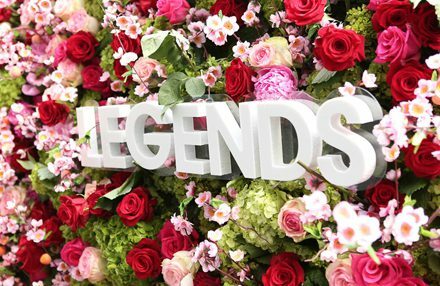 Join Paul Ferrante for Happy Hour and sip “cocktails through the decades” in celebration of LEGENDS 2018 and our showroom’s 60th anniversary on Melrose Place. Nicky Rising hosts her annual vendor cocktail party celebrating the launch of John Robshaw embroidered fabrics and other new vendor fabrics and wallpaper. Joining her are Melrose Avenue neighbors Carole Decombe and Gracie wallpaper. Join Serena & Lily and window designers Shannon Wollack and Brittany Zwickl of Studio Life/Style f​or the best pizza and wine L​.​A​.​ has to offer provided by our all-time favorite on Fairfax. Enjoy the ultimate resort-style cocktail hour with Sherle Wagner and Jenn-Air. Indulge in delicious wines, tasty bites, and smooth tunes. Window designer Sandra Espinet will also be on hand to sign her latest book, Barefoot Luxury: Mexican Resort Living. Wind down the day on Melrose as Nicky Rising hosts her annual vendor cocktail party celebrating the launch of new fabric, textile and wall covering collections. Hosted by 4th generation company president Mike Gracie, small bites and sips are served at Gracie.